Recently, the Wiki Education Foundation hosted our first-ever event to raise awareness and build financial support for our work. 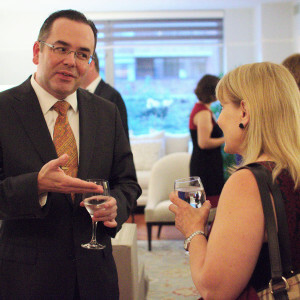 Graciously hosted by Judith Barnett in her Washington, D.C. residence, the conversation-filled event brought together more than 30 people, including select Wiki Ed board and staff, current and prospective supporters, members of academia, and other thought leaders in the open education space. The event was designed to attract new financial support for the organization, connect Wiki Ed to prospective funders or like-minded organizations, and meet future fundraising event hosts. With remarks from Executive Director Frank Schulenburg, sharing of experiences from professors who participate in our Classroom Program, and many small group conversations about Wikipedia, academia, and open education, the event was extremely successful. As a direct result of this event, plans are already underway for a similar event in New York City in November. The Wiki Education Foundation is a 501(c)(3) nonprofit, and relies on the generous support of individuals and foundations. We’ve been fortunate to have early support from major donors, but to scale the impact of our work, we need to diversify our funding sources. The Washington, D.C. event was part of an overall strategy to both diversify and increase philanthropic support for the Wiki Education Foundation’s Classroom Program and the forthcoming Wikipedia Year of Science. The Wiki Education Foundation has supported more than 14,000 students, and we aim to support tens of thousands more in the years ahead. To learn more about ways you can get involved, contact me at tom@wikiedu.org or go to www.wikiedu.org/support.